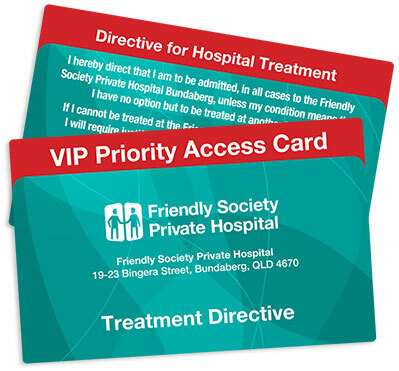 The Friendlies VIP Card is for any patient who would like to make their choice of hospital known to other health professionals. In recent years we have received a lot of patient feedback about difficulties being admitted to The Friendlies in event of an emergency. The Friendlies will be opening an Emergency Department in September, 2018, to alleviate some of those difficulties. From September, if you need an Ambulance you may be able to be brought directly to The Friendlies. Your paramedics will be the best healthcare professional to make this decision, based on your case. The Friendlies recommends you let Queensland Ambulance Service staff know your preference of hospital. The VIP card can help you make your choice known, simply by showing your card. Currently, if you need admission to hospital, you can show this card to your GP or to staff at Bundaberg Hospital to let them know your choice of hospital. If you continue to experience difficulties in being admitted to The Friendlies, we ask you call the number of the back of the card so we can help assist in your admission. If you have any questions or would like a card, please enter your details below, or telephone Business Development Manager Stuart Bonnett on (07) 4331 1266.